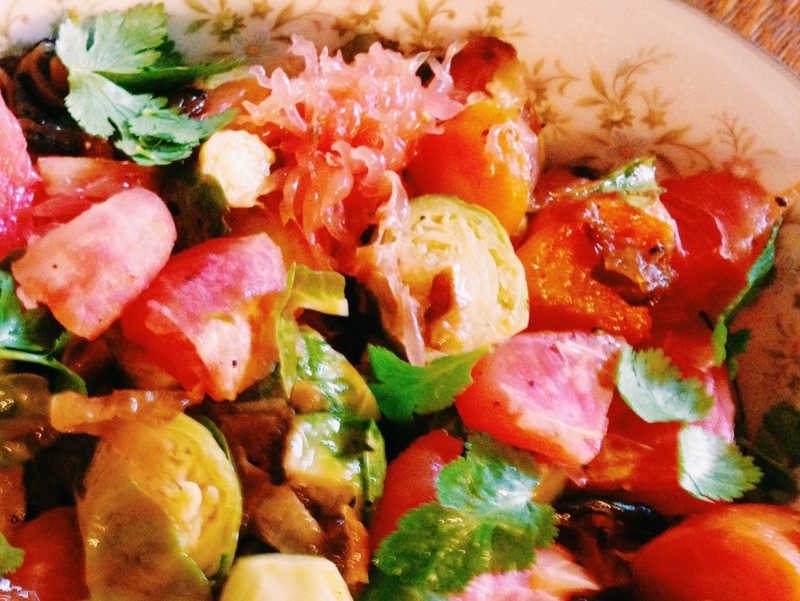 Roasted brussels sprouts with grapefruit? I know it sounds strange, but this dish, based off of “Roasted Brussel Sprouts with Pomelo and Star Anise” from the new Ottolenghi cookbook, Plenty More, turned out like so many dishes from Ottolenghi. Your first reaction might be “Really? Those things all together?” but the end result is surprising and delicious. I was cooking in the Midwest, where I’ve found that brussel sprouts often cost significantly more than they do on the East Coast. I decided to supplement the brussels with some carrots, which I roll cut for visual appeal, and roasted with the brussels. Instead of shallots, I caramelized two onions, which brought some sweetness and umami to the dish. And I couldn’t find any pomelo – a citrus fruit that is a cross between a sweet grapefruit and an orange with a very thick pith – so I just used a regular old pink grapefruit, to great results. The fresh cilantro is a must, and don’t skip on the star anise syrup either — both of these elements bring interesting South East Asian influence to the dish. Simple, beautiful, interesting — what more could you want?